Who, where, when: Navy (0-1) at Penn State (0-2), Saturday, 3:30 p.m. Eastern. Navy last played PSU in 1974, earning a 7-6 upset win in Happy Valley. TV: ABC or ESPN2 (Check local listings; Mike Patrick and Ed Cunningham have the call). Gambling is illegal in most states: Penn State is a six-point favorite. Speaking of points …: They’ve been hard to come by for both teams in this young season — Navy barely cracked double digits against Notre Dame, falling 50-10, and the Nittany Lions have scored 30 points in two games this season, falling to Ohio (24-14) and Virginia (17-16). Complicating Navy’s push toward the end zone will be Penn State’s rush defense, which has allowed a stingy 2.9 yards per carry. 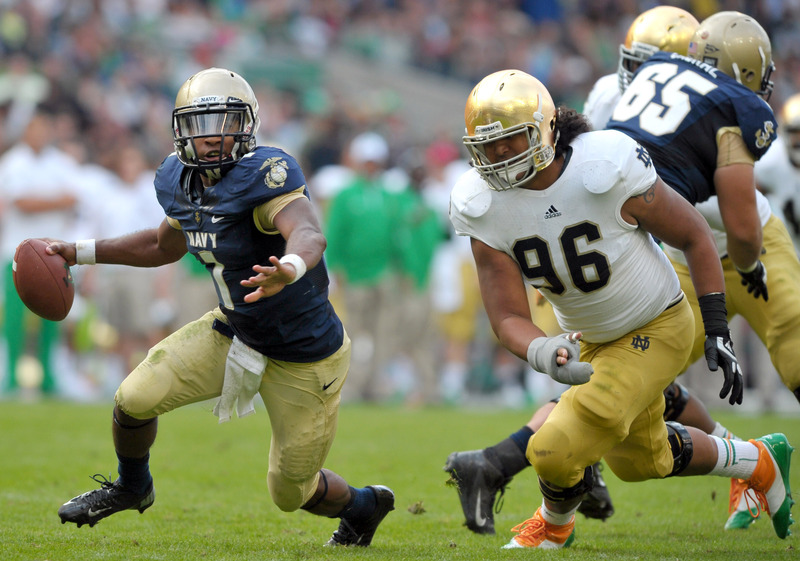 Navy’s likely unable to mount a pass-heavy assault if its option attack falters, so it’ll be strength-vs.-strength. Will the Nittany Lions’ sea-service insider give them an edge? Injury update: Another blow to any potential Navy passing attack — junior wideout Matt Aiken, whose summer knee injury kept him out of the Notre Dame game, likely won’t return this week. Junior quarterback Trey Miller, who limped through much of the Notre Dame game, has looked better in early week practices, head coach Ken Niumatalolo told The Washington Post. Stopping Mr. Robinson: Penn State sophomore wideout Allen Robinson has hauled in 19 catches for 189 yards in two games. Navy’s leading wideout last season, Brandon Turner, had 14 catches all year. Robinson might meet up with Navy cornerback Parrish Gaines, who had an interception and a team-best 12 tackles during the season-opening loss in Dublin. Getting their kicks: At one point this offseason, Navy had a half-dozen placekickers listed on its depth chart, with no indication who’d take over the starting job. Now, one game into the season, freshman Nick Sloan is 1-for-1 on field goals (a 26-yarder) and 1-for-1 on extra-point attempts. But the focus won’t be on how Sloan handles kicking in front of 100,000 Penn State fans; instead, PSU sophomore Sam Ficken will be under the microscope after missing four of five field goals this year and a critical extra point in Saturday’s one-point loss. Penn State coach Bill O’Brien went out of his way to stand by his kicker this week, but any further miscues could turn the crowd against Ficken and give the Mids a major edge.